STOCKTON, Calif. - Stockton Ports pitching was unable to find a shutdown inning on Friday night at Banner Island Ballpark. Every time the Ports scored, the Rancho Cucamonga Quakes had the answer in the ensuing half inning with the Quakes scoring the go-ahead run in the seventh on their way to a 4-3 win over the Ports, leveling the series at a game apiece. Stockton's offense opened with a bang in the bottom of the first as Nick Allen and Alfonso Rivas each hit solo homers off Quakes starter Edwin Uceta to give the Ports a 2-0 lead. Rancho Cucamonga benefitted from Ports starter Mitchell Jordan hitting back-to-back hitters to start the second. Those runners would be at second and third with two outs and score on a single by Steve Berman that tied the game at 2-2. Those were the only runs surrendered by Jordan as he had a chance to win the game but would be rendered a no-decision, going five innings and allowing two hits while hitting three batters and striking out seven. Stockton took the lead back in the fifth as Jonah Bride doubled to start the inning and scored three batters later on a two-out infield single by Lazaro Armenteros, giving the Ports a 3-2 lead. It was the last run surrendered by Quakes starter Edwin Uceta, who did not factor into the decision after going five innings and allowing three runs on six hits while striking out eight. Sam Sheehan (0-1) entered to work the sixth inning for Stockton and issued a leadoff walk to Deacon Liput. Liput would advance to second on a sacrifice bunt, get to third on a passed ball and score on a wild pitch that tied the game once again at 3-3. Sheehan stayed on to work the seventh and hit Brayan Morales to open the frame. After Sheehan walked Berman, he struck out Brandon Montgomery for the first out of the inning. At that point, Pat Krall was summoned in relief and Krall surrendered an RBI single to right to Jeren Kendall. The hit was Kendall's first of the series and gave the Quakes a 4-3 lead. The run was charged to Sheehan who was tagged with the loss after going 1 1/3 innings and allowing two runs (one earned) without allowing a hit while walking three and hitting a batter. Logan Salow (1-0) came on to work the sixth for the Quakes and pitched two scoreless frames, working around a walk issued in each of his two innings. Salow would go on to pick up the victory in the contest. Ryan Moseley (SV, 1) pitched two scoreless innings to close out the game and earn his first save of the season as he retired six of the seven batters he faced. 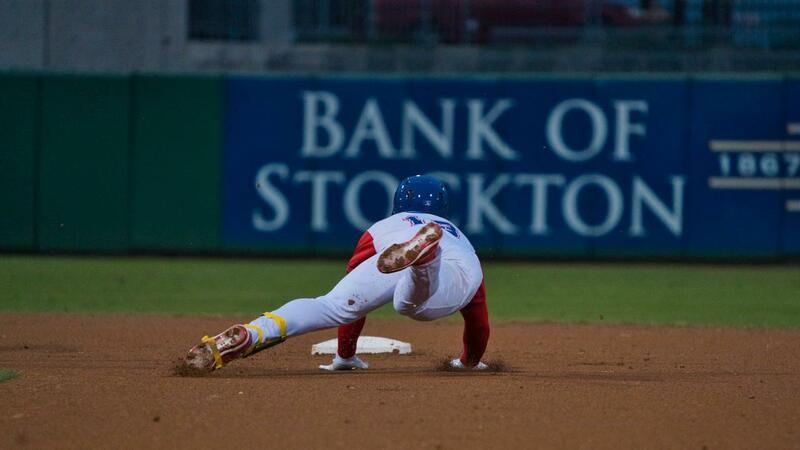 The Ports and Quakes play the third game of their four-game set on Saturday night at Banner Island Ballpark. Brady Feigl (0-0, 0.00 ERA) makes his California League debut for Stockton, opposed by Quakes left-hander Bryan Warzick (0-0, 0.00 ERA). First pitch is set for 7:10 p.m. PDT.